I call this Spanish Omelette because that’s what my Mum always called it when we were kids! 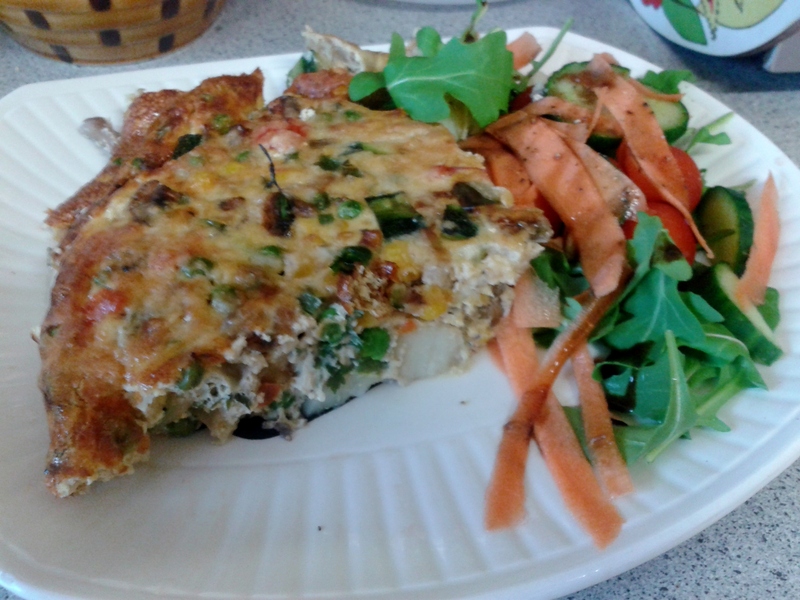 It’s similar to a Spanish tortilla omelette but they don’t tend to have all of the extra vegetables in, just potatoes. This is a brilliant, tasty and healthy meal that you can eat either hot or cold, for lunch or for an evening meal. It’s packed full of protein so, with the addition of the potatoes, it is very filling. It also manages to cram plenty of your 5 a day veggies in there too so there’s lots of fibre and vitamins. If eating as an evening meal, I would have a quarter of the omelette with some side salad. If you are having it for lunch then just have a sixth but with more salad. It’s great for packed lunches too as it holds together well in Tupperware! If you want to make a vegetarian version, just leave out the bacon or you could just as easily use the Quorn veggie bacon strips. An alternative to bacon might be grilled chicken pieces / Quorn chicken pieces. 1. The dish you need to fit all of these ingredients in needs to be 10.5 inches (26cm) in diameter and at least 1.5 inch (4 cm) deep. For less washing up the ideal would be to cook the omelette all in one frying pan. If you don’t have a frying pan large enough then you can use a ceramic flan/pie/tart dish with these dimensions. 2. In a saucepan, cover the cubed potatoes with boiling water. Cook for 10 minutes until softened but still firm. Drain well. 3. Grill the bacon until done, but not too crispy. Cut into strips and set aside on a plate for later. 4. Heat the oil in a large frying pan, preferably the one you’ll use to finish cooking the omelette in, over a medium heat. Fry the potatoes for 5 minutes, turning to brown on all sides. 5. Add the rest of the vegetables and fry for 8-10 minutes further until all are softened. Turn heat off or just keep it over a low flame. 6. Stir in the fresh or dried thyme. 7. In a jug prepare the omelette mix. Beat the 8 eggs together with the milk. Add the dried herbs, paprika and black pepper. Beat again until the herbs and spices are mixed through with the eggs. Heat the grill on full, allowing enough space for the frying pan to fit comfortably under the grill with the handle (especially if plastic or wooden) pointing outwards so that it does not burn. If you are using the frying pan to cook the omelette, return the vegetables to a medium/high heat. Stir in the bacon, if using. Spread the vegetables as evenly as possible over the base of the pan. 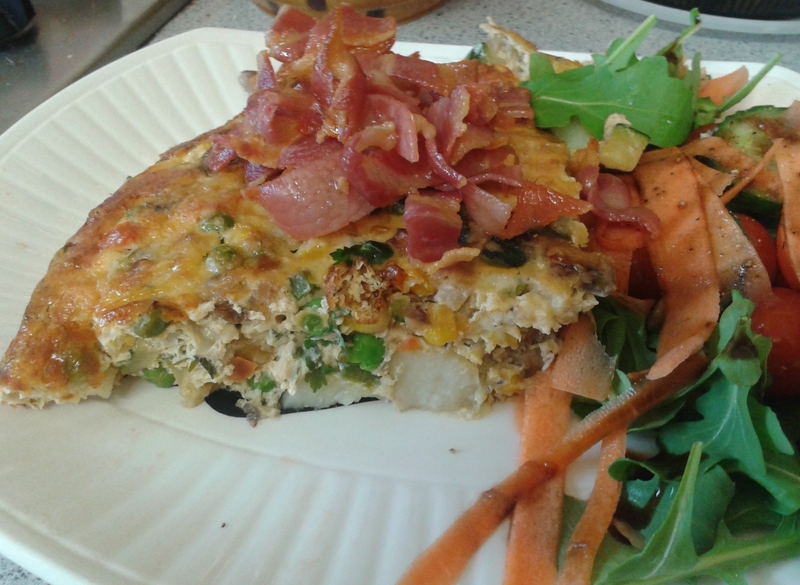 Pour the omelette mixture over the vegetables and allow it to settle down into the spaces. Cook the base of the omelette until you can see the edges browning – approximately 5-8 minutes. Sprinkle the grated cheese evenly over the top of the omelette. Place the frying pan under the grill. Leave to cook for 10-15 minutes, checking occasionally to ensure it doesn’t burn. Stick a knife into the centre of the omelette. If it comes out without raw egg on it, it’s done! Heat the oven to 180°C. Use just a little oil to grease the flan dish. 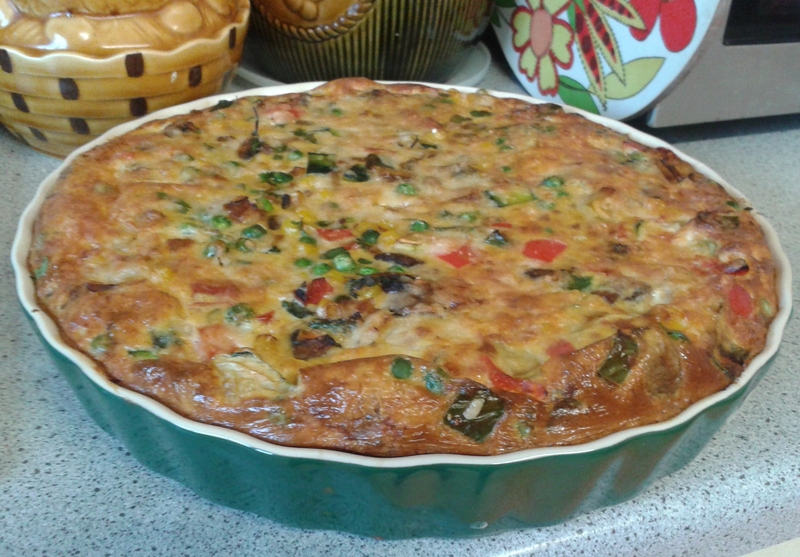 If you are using a flan or pie dish, stir the bacon into the vegetables. Spread the vegetables as evenly as possible over the base of the pan. Pour the omelette mixture over the vegetables and allow it to settle down into the spaces. Sprinkle the grated cheese evenly over the top of the omelette. Place the dish in the oven and cook for 40-50 minutes, until the omelette is firm on top.